Google Android operating system is ruling the roosts nowadays. This OS has become the most popular OS for mobile devices like smart phones and tablet computers. Users of Android devices often ask how to close running apps on their phones and tablets. Only some of the Android apps shut down when you press the Back button. Other apps just go into the background and keep on running until you explicitly close them. These running apps will occupy memory of your mobile device (smart phone, tablet etc.) and if you do not have enough free memory left, these background apps may slow down your mobile phone or tablet. Take the following steps to accomplish the goal. Please note that because different manufacturers modify Android to give it their signature touch, your screen may look slightly different. One of the categories would be “Running Apps”. Select this category and you’ll get the entire list of apps that are currently running. 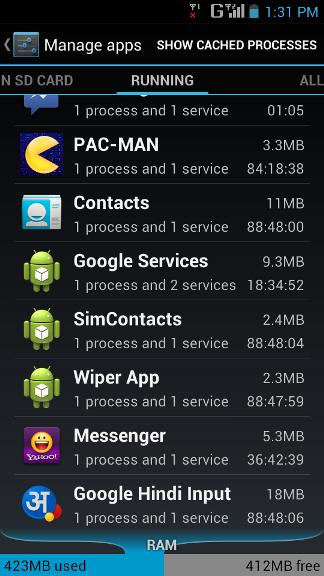 You’ll also see the list of apps that are currently residing in memory (RAM) of your device. In addition, you’ll also see the amount of memory each app is occupying. You can tap on any app to get the option of closing and stopping it. In some devices, like the ones manufactured by Samsung, you’ll see a button to the left side of Home button. By tapping on this button, you’ll get the list of recently used apps. Also, you’ll see a pie chart like button which will open “Task Manager”. When you’ll open Task Manager, you’ll get the list of Active Apps. Here also you can select and close any app. It is important that you keep stopping unnecessary apps in order to keep memory of your Android device from getting cluttered. I hope this was useful for you. Please feel free to ask if you have any questions on this topic. I will be happy to try and help you. Thank you for using TechWelkin. this post is informative. many apps occupy space and some are unnoticed too. thanks.